Diese Schönheit ist das 50th Anniversary Modell von Sankyo. Basierend auf Sankyo 801, aus Ag 950 (95% reinem Silber) mit gelöteten 10k Gold-Tonlöchern. Klappen, Mundplatte Zierringe und Kamin sind ebenfalls aus 10K Gold, Mechanik und Krone sind vergoldet, und die gesamte Flöte, von der Krone, den Zierringen, der Mundplatte bis zu den Klappen, ist graviert. This beauty is the 50th Anniversary model of Sankyo. 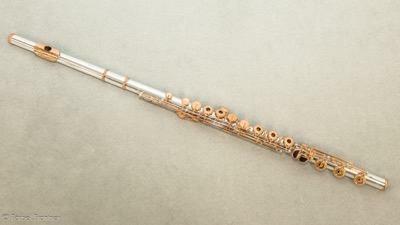 Based on Sankyo 801, made of Ag 950 (95% pure silver) with soldered 10k gold tone holes. 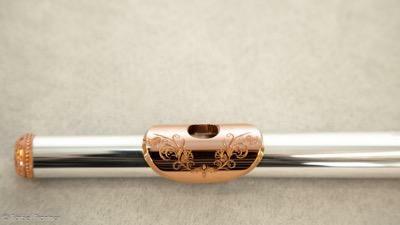 The keys, mouth plate, decorative rings and chimney are also made of 10K gold, the mechanism and crown are gold plated, and the entire flute, from the crown, the decorative rings and the mouth plate to the keys, is engraved.